Previous articles in this series have reviewed recent research on methane sources from beneath permafrost and ice sheets. Part 1 looked at subcap fossil methane seeps in Alaska;Part 2 provided a perspective for the size of these seeps in relation to other natural and human sources; and Part 3 looked at potential methane sources resulting from the withdrawal of glaciers and ice sheet. In this final section, I will try to make estimates of what subcap methane emissions may mean for future climate change; more as a speculative basis for discussion rather than an authoritative prediction. Firstly, though, I will argue for a role for subcap methane emissions on the East Siberian Arctic Shelf (ESAS). Subcap methane on the East Siberian Arctic Shelf? • Seepages of thermal gas from the sedimentary column into the sea water were detected at two locations at the northern margin of the shelf, indicating the rather uneven distribution of petroleum seeps in the Laptev Sea. • This uneven distribution probably reflects the occurrence of sub-sea permafrost. The south and the centre of the Laptev Sea is underlain by a permafrost layer several hundreds of metres thick, generally preventing petroleum from seeping into the water. In the north, the permafrost is absent, allowing the migration of hydrocarbons into the water column. Figure 1. Seismic reflection section from the Laptev Sea (location shown by green star on the map). The interpretation shows faulted and tilted sedimentary rocks, a weak reflection at ~0.5 seconds that may mark the base of the permafrost, and indications of what may be gas migration chimneys. The section comes from Cramer and Franke, 2005 (their Figure 3); and the map is adapted slightly from Franke and Hinz, 2009, (their Figure 3). The map’s contours and colours represent two-way time to basement rocks; this is the time taken by an acoustic wave to get from the surface to a reflector and back, and is proportional to depth for a given velocity. 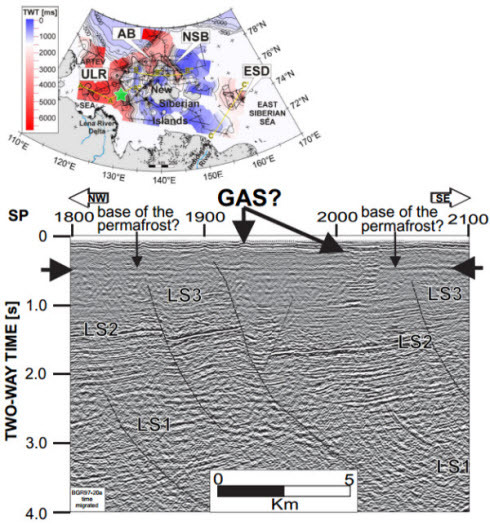 There are signs on the seismic reflection section in Figure 1 that fossil gas may have started to penetrate the permafrost cap. In other seismic sections in the permafrost-free areas further north (CF5 Figure 4) there is more clear-cut evidence of active gas seepage. It seems quite plausible, therefore, that at least some of the gas emerging in the East Siberian Arctic Shelf is subcap fossil methane. 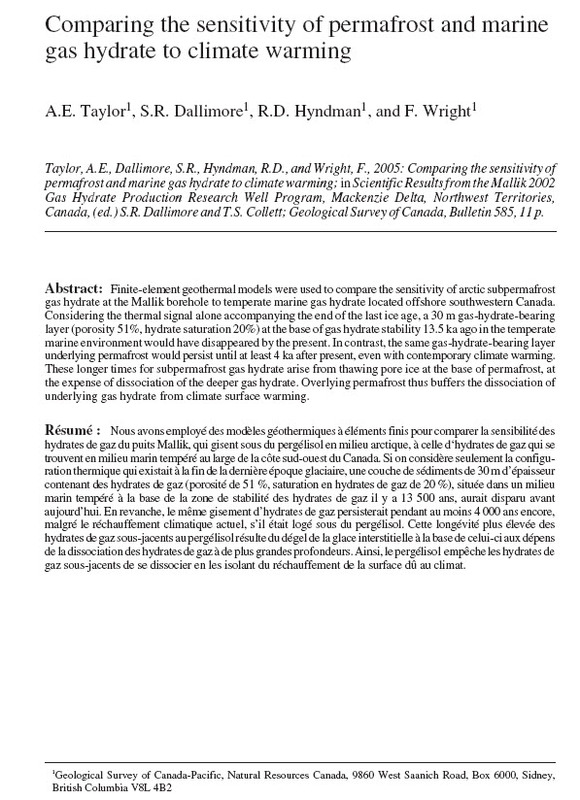 It is not yet clear whether this gas is present below the permafrost as free gas or as methane hydrates or both. In the New Siberian Islands further east on the ESAS, the sedimentary basins may be too thin and shallow (~1.5-2.5 km) to have generated fossil methane. (Depths greater than ~3 km are usually needed to produce thermogenic methane, for example, see here Figure 6.) Figure 9 in CF5, however, does show evidence of a gas seep from a thin sedimentary section north of the New Siberian Islands. In response to our questions in a previous Skeptical Science article, Natalia Shakhova noted that her preliminary isotope studies of the released East Siberian Arctic Shelf methane show mixed origins for the gas. On the basis of modelling studies, Nickolsky et al. (2012) argue for the presence of submerged thaw lakes and open taliks over large areas of the ESAS. It is quite possible, therefore, that some of the venting gas observed on the ESAS could be fossil methane, previously trapped beneath the permafrost as free gas or gas hydrates, finding its way to the surface through a cryosphere cap that has been degrading over the past 10,000 years. A large, but transient expulsion of subcap methane is expected to increase surface carbon cycling with implications for greenhouse gas feedbacks to climate warming in a future scenario of widespread permafrost thaw and wastage of glaciers and ice sheets. The magnitude and timing of this emission scenario is unconstrained due to large uncertainties in estimating future rates of cryosphere degradation, hydrocarbon reservoir response, and potential methane oxidation. From the Supplementary Information of Walter Anthony et al (2012). Walter Anthony and her colleagues chose not to speculate on the timing or quantity of any future transient release of sub-cap methane. Since this is a science blog article and not a formal scientific publication, I need not feel quite so constrained. Readers are advised to treat the following sections as a thought experiment and not the reporting of peer-reviewed research. Walter Anthony et al (2012) estimated that the current geologic seepage rates in the Arctic amount to approximately 2 Tg of methane per year (+/- 0.4 Tg/yr). Further, they estimate that in the far future, once the permafrost cap has gone, the seepage rate in the Arctic will be approximately 11 Tg per year. Assuming that the flow rates from the deep geology are uninfluenced by what is happening in the near-surface, this leaves something like 9 Tg per year currently being held back by the permafrost seal. How long this situation has been in existence and how long it will take for the permafrost seal to disappear are obviously uncertain. However, if we assume, just for the sake of getting a ballpark estimate, that the permafrost fossil methane “capacitor” has been holding back the gas flow for 10,000 years and will discharge over 1000 years of future warming, we could look forward to an additional average transient flux of 90 Tg of methane per year (a 25% increase over current anthropogenic methane emissions). Alternatively, if we assume 50,000 years of hold-back and 500 years of release, we could expect an average flux of 900 Tg per year, a tripling of current man-made methane fluxes. In CO2-equivalent terms, multiplying the weight of methane by a factor of 25, these estimates would range from 2.3 billion tonnes per year to 23 billion tonnes per year, or approximately 7-70% of current CO2 emissions. This is, roughly speaking, like adding, instead of subtracting, one of the Princeton Wedges in the low case or, in the high case, adding subcap emissions equivalent to global fossil fuel emissions of the 1990’s. Of course, simplistic calculations based on uncertain estimates and baselines, especially when the calculations are unconstrained by physical models, do not make for a reliable forecast. They do suggest, however, that there may be the potential for this additional source of Arcticgreenhouse gas feedback to significantly amplify man-made climate change over centuries to come. Further work is required to estimate the amount of methane present under the permafrostcap, perhaps by re-analyzing the many oil and gas wells drilled through continuous permafrost. A research program planned by Canadian and Korean scientists in the Mackenzie Delta may provide key information on methane and permafrost. It is worth re-emphasizing, though, that these uncertain estimates are in addition to any emissions from the thawing of shallow permafrost and destabilization of methane hydrates. Destabilizing of permafrost-associated gas hydrates that are typically located a few hundred metres below the surface requires pervasive heating and it will take considerable time for the heat to penetrate that deeply, perhaps as much as many centuries or millennia. When hydrates are present below permafrost, on land and beneath shallow marine shelves, they are also thermally buffered by the latent heat energy needed to melt the permafrost and it could take thousands of years to destabilize the gas hydrates (Taylor et al 2005). On the other hand, releasing free gas trapped below the permafrost may require only perforation of the permafrost, perhaps by means of thaw bulbs or taliks and the transformation of continuous to discontinuous permafrost. 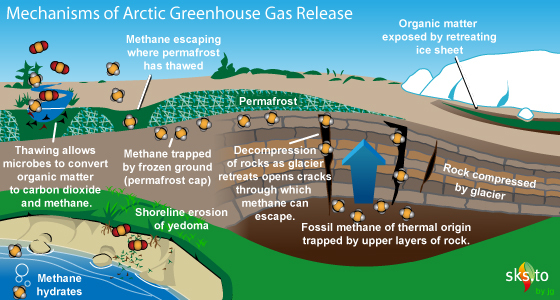 The release of fossil geological methane, currently trapped as free gas, may therefore occur sooner than from hydrates associated with permafrost. If hydrates are present beneath the Antarctic ice sheet, they could be destabilized by reducing the pressure, as a result of the reduction of the ice thickness. Since this effect would not depend on slow rates of thermal diffusion though frozen sediments, but instead by a simple loss of ice, which could occur more quickly, such hydrates might be more vulnerable to destabilization than hydrates buried under permafrost. Any methane released from under retreating ice sheets is more likely to find its way into the atmosphere than methane released from deep-sea methane hydrates, because the methane-consuming seabed sediments and the overlying sea water are absent in Antarctica. Vast quantities of methane hydrates are also found throughout the world just below the seabed, in locations where water depths are greater than a few hundred metres. In the Arctic, because the water is particularly cold, hydrates may be found at depths as shallow as 290m and, because the Arctic is warming about twice as fast as the rest of the planet, the first marine hydrates that dissociate due to global warming will be found in the Arctic. However, most of the methane produced from dissociating marine hydrates will be consumed by anaerobic processes in the top few metres of sulphate-rich near-sea-floor sediments and all of the rest will be dissolved and oxidized in sea water and will not be released to the atmosphere as methane, although the dissolved CO2 will equilibrate with atmosphere after a few centuries. See Ruppel (2011) for a good review. A sudden release of methane hydrate, for example, as a result of a submarine landslide (e.g., Bryn et al, 2005), might allow methane to be released to the atmosphere, but the amounts released from an individual landslide is expected to be small (RealClimate). “Our calculations with various computer models show clearly that the climate in the next hundred years will not be threatened by any additional danger from methane gas release”, summarizes the main author of the study Dr. Arne Biastoch. “The gas hydrates are dissolving with a time delay, so that the consequences will be felt in two to three hundred years – a time frame which doesn’t allow any definitive statements to be made now. We should take these long-term consequences into account in discussions on climate change. But we shouldn’t dramatize the situation”. Schuur and Abbott (2011) surveyed 41 scientists for their forecasts of greenhouse gas releases resulting from thawing of the top few metres of permafrost. The results were that by 2100, some 47-61% of the top three metres of permafrost would thaw, releasing some 232-380 billion tonnes of CO2 equivalent. This amounts to an average release rate of 2.6-4.3 billion tonnes per year. The released carbon is mostly in the form of CO2 but the small amount of associated methane (~3%) accounts for a disproportionate amount of the expected climate forcing. Compared with the potential feedbacks from fossil methane or methane hydrates, the permafrost feedback from surface thawing is more certain and will happen sooner, very likely in this century, regardless of the level of future human carbon emissions. If I had to make a trifecta bet (picking the order of first, second and third place finishers) on the likely sources of polar carbon-cycle climate feedback, my bet would be: first, permafrost organic matter; second, fossil methane from beneath the permafrost cryosphere cap; third, methane hydrates from below permafrost, the deep (>300m) ocean and, perhaps, from beneath the bigice sheets. Figure 2. Schematic diagram of the many ways that greenhouse gasses can be released as a warming climate in the Arctic leads to collapse of the cryosphere. Graphic by John Garrett. Katey Walter Anthony and her colleagues have demonstrated that the largest seeps in Alaska are associated with the release of fossil methane derived from deeply buried organic matter in old, pre-ice-age sediments. The big seeps are mostly associated with continuous permafrost, near the boundary with the area of discontinuous permafrost. The seeps of fossil methane contribute about one-quarter of the current methane seeps in Alaska, with the rest coming from smaller, but much more numerous, shallow seeps that are related to microbial decomposition of organic matter as it thaws out of the permafrost. Future deep thawing of the permafrost may result in an increase in the rate of fossil methane emissions but well-constrained estimates of quantities and timing of such releases are not yet possible. However, back-of-the-envelope estimates suggest that such releases could, one day, be significant in terms of their climate impacts. Deglaciation may also cause two other types of methane release: one associated with the reactivation of faults above deep gas accumulations; and the other with exposure of organic matter as ice sheets retreat. Other recent papers have noted the potential for the accumulation—and possible future release—of very large quantities of methane hydrateunder continental ice sheets. The fastest and most certain carbon cycle feedback from the thawing permafrost is from near-surface melting, as reported by Schuur and Abbott (2011). Future contributions from fossil methane and from methane hydrates are more poorly constrained and are less likely to be an immediate big factor for climate, although their potential contribution over centuries to come is huge. Once the Arctic carbon-cycle feedback boulder starts rolling down the mountainside, its course will be uncertain. Perhaps it will quickly come to rest again, or maybe it will trigger an avalanche that will wipe out the village below. This would be an entertaining and educational spectacle to watch from a safe vantage point on another planet, but the responsible thing for those of us who live here to do, of course, is to stop the fossil fuel emissions that are currently levering this boulder over the brink. This entry was posted in Hard Science and tagged Arctic, East Siberian Shelf, Hydrates, Methane, Permafrost. Bookmark the permalink.